One of our favorite green bean recipes. 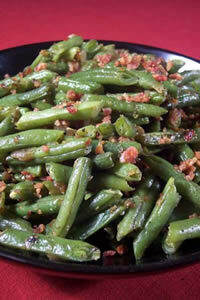 This is a very tasty and very easy green bean recipe. When we make this dish we splurge and get thick sliced bacon from the deli counter. We also like the taste of red onions in this dish. Place the green beans into boiling water and cook, covered, for 20 minutes or until tender. Drain. Cook the bacon until crisp. Remove bacon from pan, drain on paper towels. Add chopped onion into bacon fat. Cook until translucent. Add vinegar, sugar, and salt in with onions. Stir to mix well making sure sugar is completely dissolved. Add green beans to onion mixture. Cook to warm through. Plate. Crumble bacon on top to serve.